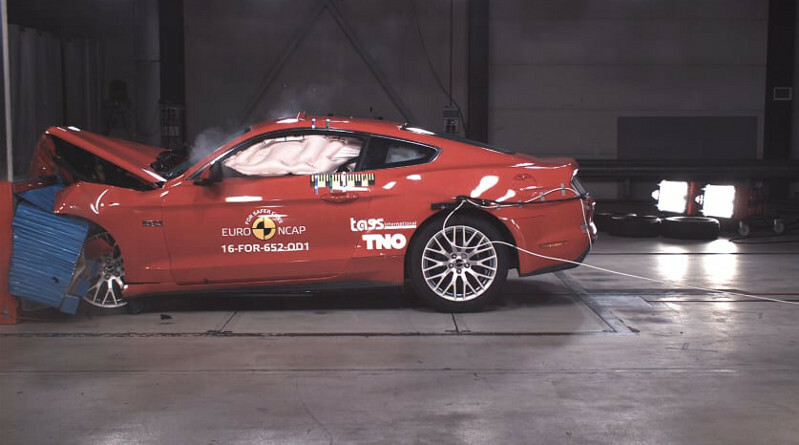 The Ford Mustang has scored just two stars in the latest Euro NCAP crash tests. It’s the first time since 2008 that a car from a top 10 manufacturer has scored two stars, according to Thatcham Research. Update 5 July 2017: Ford has taken Thatcham’s criticism of the UK Mustang to heart and has upgraded the car’s safety equipment. Pedestrian Detection, Forward Collision Warning, Autonomous Emergency Braking (AEB) and a Lane Keeping Aid will all be standard fit on future UK-spec Mustangs. These improvements have lifted the Mustang’s Euro NCAP safety rating to 3 stars. For the first time in the 53-year history of the legendary Ford Mustang sports car, the US auto giant has recently started making a right-hand drive model and importing the Mustang into the UK. Unfortunately Ford doesn’t seem to have bothered to alter the car to meet modern European standards of safety. The Mustang scored just two stars in the latest round of Euro NCAP crash safety tests. Apparently, neither front airbags nor rear seatbelts worked as effectively as you’d expect in a modern car. The front airbags failed to inflate sufficiently to restrain the driver and passenger when the car was hit at an angle. Meanwhile, the rear seatbelts lack have neither pre-tensioners nor load limiters. As a result, the rear passenger slid under the seatbelt during the frontal impact test, implying a higher risk of abdominal industries. Finally, in the side impact crash, the head of the 10-year dummy contacted the interior trim bottoming out the curtain airbag. “What really concerns me is that Ford has made a deliberate choice. The car has been designed to score well in less wide-ranging US consumer safety tests and only minor updates have been made to meet required European (pedestrian) safety regulations.